Recently Onisha and I had the privilege to meet with an organization named Tiny Toones in Phnom Penh Cambodia while we were there in June. 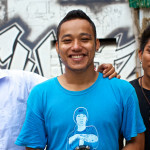 Tiny Toones is a Hip Hop community outreach center based in Phnom Penh. It was started by an American / Cambodian Bboy named KK in 2005. When we arrived in Cambodia we were very excited to meet local dancers for our spotlight interviews. I found Tiny Toones after some research for Hip Hop dancers in or around Phnom Penh and I found a contact for a dancer named BBoy Short. Short is the director of Tiny Toones and he invited me to come check out their organization the next day. When Onisha and I arrived at the community center we were amazed and inspired by what they do there. Not only do they teach Breaking, but they use Hip Hop as an education tool for all of the underprivileged youth in Cambodia. Along with dance they teach English, math, DJ’ing, Music Production etc. After visiting for a few hours we decided to return the next day to get an interview with their Bboy crew. The next day we interviewed a few of the main members – Bboy Fresh, Bgirl Diamond, Bboy Erak, Bboy Flex, and Bboy Omi. They were kind enough to conduct the interview in English as opposed to their native Khmer language. Hopefully you will be able to see from the interview the passion these kids have for dance and Hip Hop. Please let us know what you think in the comments section below. We are interested in your ideas, improvements or just general comments. Thank you.